When I think of a garden, I think lots of greenery and flowers. The first thing to come to mind is not rustic. However, when decorating an outside garden area, rustic elements provide a perfect contrast to really set the space off. To provide some inspiration, I came up with a collection of creative rustic garden ideas. Ladders are a great thing to use to add height in a garden. An old rustic ladder provides a nice contrast to the plants. 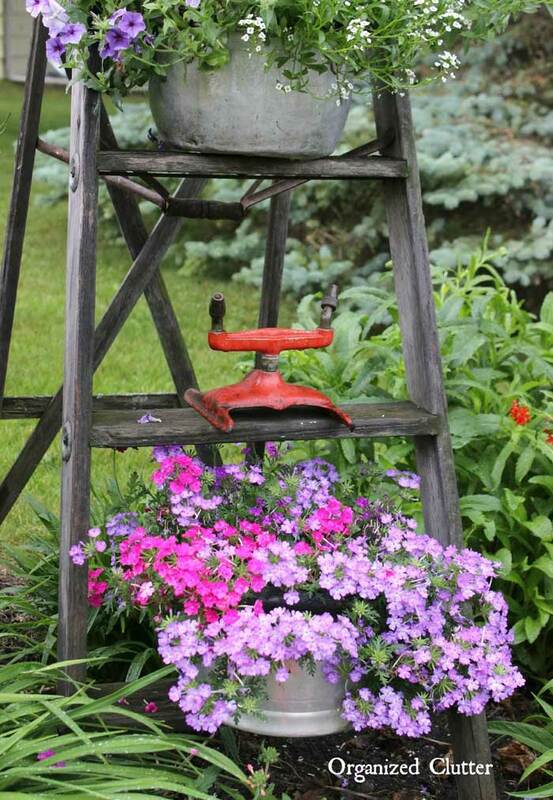 A ladder plant holder like this adds rustic warmth. Besides displaying plants, you can also display vintage items like this charming old sprinkler. 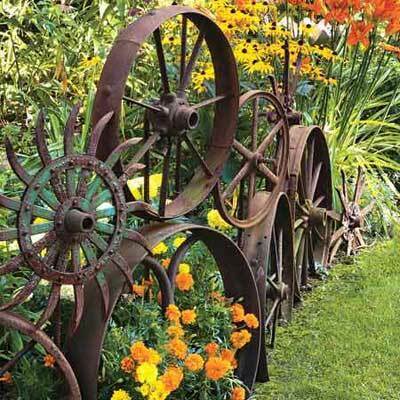 A collection of rusty wheels will add a ton of rustic interest to a garden. These wheels are displayed as a decorative border to a garden. The flowers that show through make a beautiful contrast. Chairs don’t have to be used just for sitting. 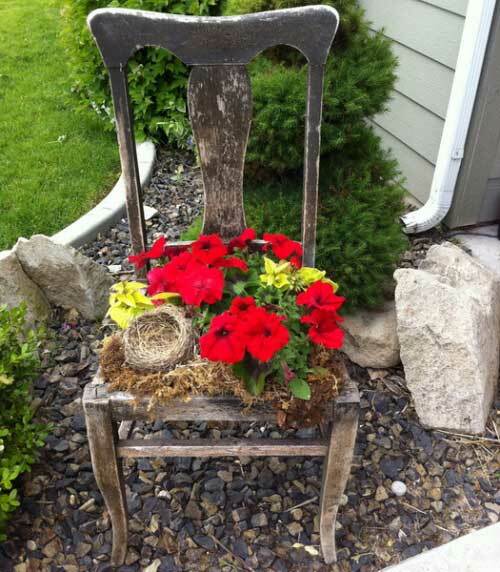 A weathered or otherwise rustic chair makes a perfect flower planter chair. Like a ladder, this chair adds some needed height in the garden. You can use pretty much any rustic container as a planter. However, old drawers have a certain charming appeal. Not only do drawers make great planters but stacking drawers adds visual interest and height. 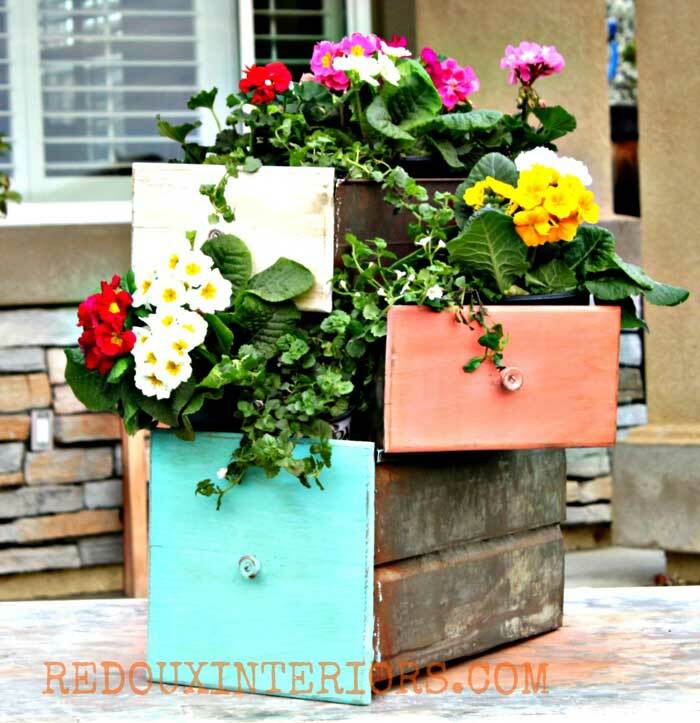 These colorful drawer planters are especially unique for a rustic garden. Normally a wheelbarrow is used when creating a garden. However, when the garden is complete just haul your old wheelbarrow out to the middle of it. A wheelbarrow is yet another great rustic item to use as a planter. 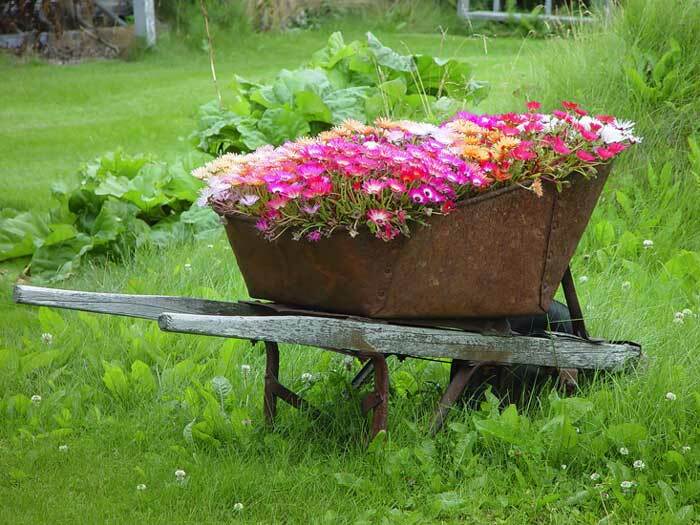 A wheelbarrow planter can hold a lot of flowers making it a wonderful addition to a rustic garden. Do you have any rustic garden ideas that you would like to share? I love gardening and it looks like I can get out there pretty soon! I live inMinnesota and today it is supposed to hit the 60’s. this winter has been way to long . I think we have had 5 snowstorms this month! Yuck! Hope your weather is better. Our winter has been too long too but I think we are on the upswing now….yay! Enjoy your nice weather!